There were, for example, the Paramount screwball comedies, College Holiday in 1936 and College Swing two years later teaming Hope and Raye. Then there was the romantic comedy Never Say Die (see above) in 1939. And after Betty Grable became a GI pinup sensation in the mid-Forties, 20th Century Fox honcho Darryl Zanuck rushed his newfound star into that piece of musical fluff, “Pin Up Girl,” teaming Betty with Raye, Joe E. Brown and the Charlie Spivak Orchestra. It was in glorious color and was a hit. In fact, Raye rolled up some 40 credits from 1936 to 1985, most of which were movies. Born of vaudevillian parents perhaps literally in a backstage trunk — this time in 1916 in Butte, Montana — Raye started her performing career early, at age 10 to be exact. She later turned big band singer then all purpose comedienne. Her style was broad as the side of a barn, as shown in the photos below with Judy Garland. Like Hope, Rayne became a fan favorite on a host of USO tours she undertook at some personal stress — she hated flying — and for which she was awarded in 1969 a special Jean Hersholt Humanitarian Award by the Motion Picture Academy and the Presidential Medal of Freedom by President Clinton in 1993, a year before she died. 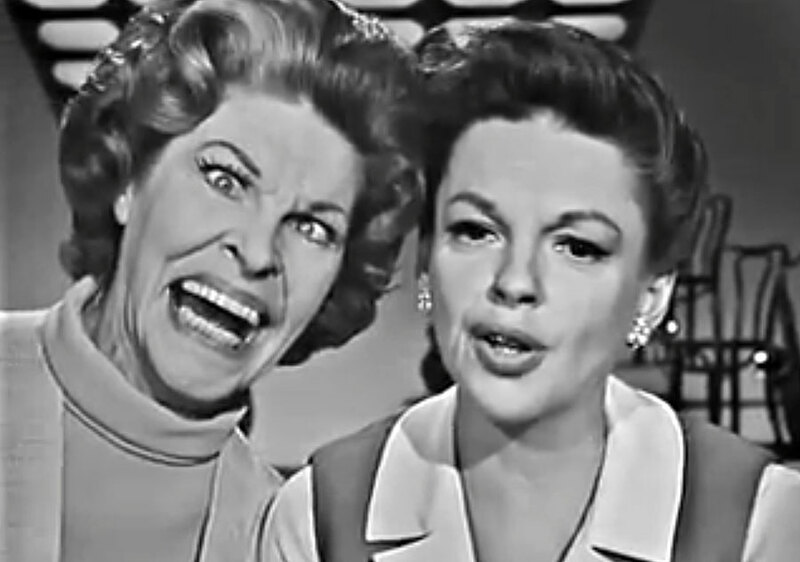 Raye is perhaps best recalled today for her many tv and stage appearances, and for her personal affairs. Her married life was well into Elizabeth Taylor territory — seven husbands over some 50 years, the last a bisexual fur designer 33 years her junior. She survived a suicide attempt and the encroachments of several illnesses. Still in all that daffy “Big Mouth,” as she was known, had quite a movie career. And surprisingly, this lousy picture, the very worst of the AIRPORT movie franchise, was written by Eric Roth, the man who would later give you FORREST GUMP. But getting back to Martha “Big Mouth” Raye… Her eclectic list of husbands would give Joe & Frank enough to talk about for a week. I think Martha Raye was well looked after and entertained with just the first two on her list of husbands! I was told the following story by the late Maxine Andrews. Andrews had been approached by the makers of Polident about becoming their TV spokesperson. Because she wasn’t a denture wearer at the time, she repeatedly declined their offers, but they kept pursuing her, finally saying they’d like to attend her nightclub performance that evening, then meet with her afterward to discuss it. Thinking that it would be an opportunity to turn them down in person once and for all, Andrews agreed. As luck would have it, Martha Rate was attending that night, and arrived in Andrews’ dressing room prior to the performance (feeling, shall-we-say, a little happy?) and insisting that Andrews needed “a star to introduce” her. Seeing Raye’s condition, Andrews attempted to dissuade her, but Raye was adamant, and finally Andrews had no choice but to relent. The Polident people saw a celebrity who obviously wore dentures, and who obviously had no compunction about revealing that fact in public, and promptly signed Raye as their spokesperson.